Anime Expo is upon us, and Netflix is taking the opportunity to remind us that it has a metric buttload of anime and anime-adjacent shows on the way, with returning series like the bloody awesome Castlevania adaptation and the extremely cathartic return of Aggretsuko. But it’s also got a couple more surprises on the way, too. Sadly for those of us with a burning rage deep within will have to bottle it up for a little while longer (unless you’re going to make a karaoke trip) when it comes to Aggretsuko’s return—although the show has a brief new teaser, season two of the Sanrio mascot’s delightful show won’t air until 2019. But aside from the returning favourites, Netflix also has a bunch of new anime movies and series coming to its service in the next year. First up is the sequel to the wild sci-fi Godzilla anime movie Monster Planet, Godzilla: City on the Edge of Battle, which is set to premiere on Netflix on July 18, but beyond that there’s also the Bones series Dragon Pilot—about a young pilot in a fantastical air force being chosen by a mysterious dragon to be its chosen rider—set to launch September 21. Teaser art for Ultraman, Kengan Ashura, and Cannon Busters, all hitting Netflix in 2019. Joining Aggretsuko in 2019 will be another trio of acquisitions. 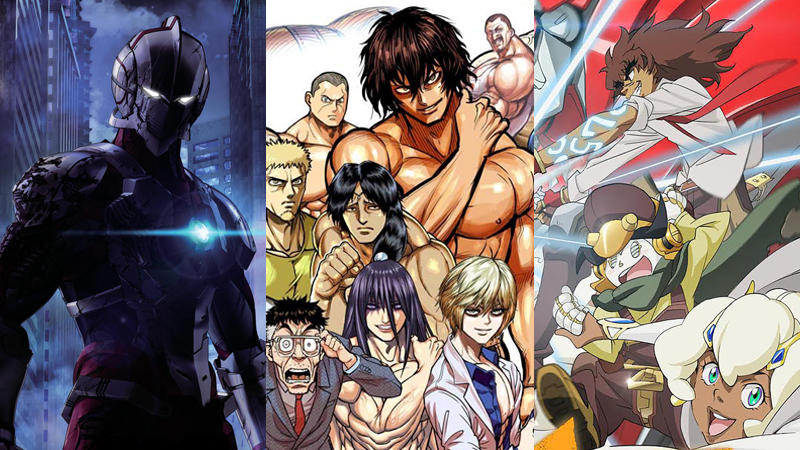 There’s the worldwide debut of Ultraman, Production IG’s adaptation of Eiichi Shimizu and Tomohiro Shimoguchi’s beloved manga take on the legendary Tokustasu hero, as well as the anime adaptation of Kengan Ashura a bizarre series about a middle-aged salary man being conscripted as a corporate gladiator to fight deadly brawls on behalf of his company. Giant-sized superheroes, gladiatorial salarymen, and robot shenanigans? 2019's gonna be a good year for anime fans when it comes to Netflix.